Multi-functional and durable the TDU shirt, now available in a variety of colours and genuine MultiCam camo at Military 1st online store, is the best selling model of 5.11 tactical shirts, modelled on well-known classic BDU jacket design. Made of lightweight yet tear resistant fabric treated with Teflon for stain, liquid and dirt resistance, this quality combat shirt provides exceptional fit and comfort of wearing in all situations and feature double reinforced elbows, a hidden documents pocket and bi-swing shoulder, along with top quality accessories such as YKK zippers and melamine buttons. 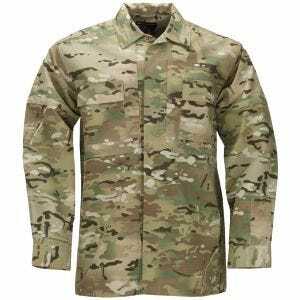 Commonly used worldwide by a large number of fire professionals, law enforcement and military personnel, this tactical shirt appeals especially to all Airsoft, hunting and paintball enthusiasts, but also to people who simply enjoy outdoor activities and look for sturdy and comfortable everyday shirt.